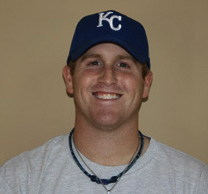 Matt Ridings, from Franklin, TN, was an All-State baseball pitcher his senior year at Battle Ground Academy. Matt then went on to have an outstanding college pitching career at Western Kentucky University and was drafted by the Washington Nationals after his junior year. He chose to stay at WKU for his senior year, but incurred an elbow injury near the end of the season. Dr. Petty reconstructed the ulnar collateral ligament of his pitching arm. He was then drafted by the Kansas City Royals and is now rehabbing at their Phoenix training facility.